Since 1996, the Center Theatre Group has recognized and celebrated local theater artists with the Richard E. Sherwood Award. In 2018 Dorothy Sherwood, Richard’s wife and fellow champion of innovative and adventurous theater artists passed away. To honor the passion and dedication of both patrons of the arts, the award has been renamed the Dorothy and Richard E. Sherwood Award. 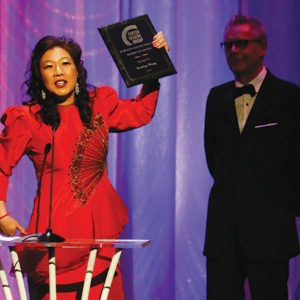 The recipient of the 2019 Dorothy and Richard E. Sherwood Award announced at the 2019 Ovation Awards is Kristina Wong. The $10,000 award aims to cultivate theater artists who are working in Los Angeles at a catalytic moment in their career – artists that push the formal and aesthetic boundaries and demonstrate a dedication to improve their respective artistic fields. The two additional finalists, Bruce Lemon and Marike Splint, will receive a $2,000 honorarium.